Lionel Edwards China is much sought after and nowadays is quite rare. 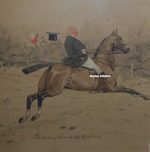 The original watercolour subjects painted by Lionel Edwards were commissioned by Soane and Smith. A full range of tableware was produced as well as miscellaneous items such as ashtrays and a cigarette box. Many scenes were depicted. The Lionel Edwards china tableware was usually on Spode’s Imperial body – a fine ivory-coloured earthenware – with a pale brown band at the edge overprinted in black to simulate an oak-grained effect. The pattern number is 2/7636 and the registration number 691240, registered with the British Patent Office in 1922. There were other versions, in shorter ranges of a more expensive nature, some on bone china. The scenes were transfer-printed from copper plates and later coloured expertly by skilled painters, the printed outline serving only as a feint guide to the artist. These printing copper plates were produced by a photo-etching process by the Sun Engraving Co. Ltd. from the original watercolour paintings. Constant wear, inherent in the transfer-printing process of pottery caused the quality of the prints to become so feint that much of the detail was lost. A point was reached at which the definition was so poor that the artists could not paint the animals correctly. The pattern was then withdrawn. All objects were decorated with one of the subjects from two ranges of studies: the main set of 12 scenes depicted some of England’s famous hunts; these were used on the 10″, 8″ and 7″ size plates, and selected subjects were used for the meat serving dishes. A second set, using the key participants of a hunting day were available on the 6″ and 5″ plates and smaller items. Both these sets of scenes carried the titles appropriate to the different stages of the hunting activities and the large plates also included the name of the hunt depicted. Please contact us for a list of Lionel Edwards china by Soane and Smith and W.T. 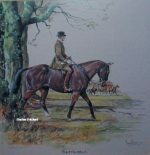 Copeland & Sons for sale and currently available. 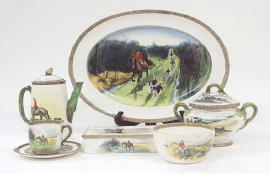 A selection of Lionel Edwards China available. If you can’t see the W.T. Copeland, Soane and Smith Lionel Edwards China that you’re looking for then please contact us on 07889 800857.